FIGS. 2A, 2B, and 2C are diagrams each showing an image circle of a fisheye lens system corresponding to a plurality of film formats, in which FIG. 2A shows an image circle corresponding to a 35 mm film format SLR camera, FIG. 2B is to an APS film format SLR camera, and FIG. 2C is to a digital SLR camera. A multi purpose fisheye (or other wide angle) lens would be very useful for photographers carrying different format DSLRs in the future. In December 2002, Nikon announced the company's first DX lenses, made especially for the smaller sensor size of Nikon's digital SLR cameras. It seemed clear that Nikon commited to the 23.7 x 15.6 mm sensor size. «However, when a 35mm (135) format lens is used with a Nikon digital SLR, the picture angle is approximately 1.5 times the focal length of the lens (35mm  format equivalent). This characteristic proved to be advantageous when producing super-telephoto lenses (e.g. 600mm becomes 900mm) and fast telephoto lenses (e.g. 400mm f/2.8 becomes 600mm f/2.8). In the case of ultra-wideangle lenses (e.g. 14mm becomes 21mm), though, it turned out to be a liability as it became difficult to produce truly compact lenses. The present invention relates to a fisheye lens system for an SLR camera and, in particular, to a fisheye lens system having an angle of view of 170 degrees or more. 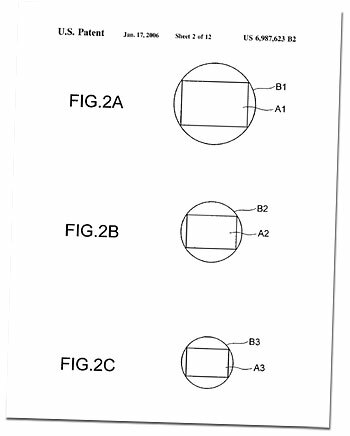 A fisheye lens having an angle of view of 170 degrees or more has been proposed, for example, in Japanese Patent Publication No. 49-20534. In a recent interchangeable lens SLR camera system, an interchangeable lens is used not only for an SLR camera having a 35 mm film format (image size: 36.times.24 mm, diagonal length: 43.2 mm), but also for an SLR camera having an APS film format (image size: 30.2.times.16.7 mm, diagonal length: 34.4 mm). Moreover, the same interchangeable lens is used for a digital SLR camera having a solid state imaging device such as a CCD (for example, image size: 23.7.times.15.6 mm, diagonal length: 28.4 mm). When the same interchangeable lens is attached to the above-described three kinds of SLR cameras (35 mm film format, APS film format, digital SLR), there has been a problem that the angle of view of the images are different with each other. The problem becomes serious when a fisheye lens requiring an angle of view of 170 degrees or more is used. When a fisheye lens for a 35 mm film format SLR camera is attached to a digital SLR camera, the angle of view becomes severely narrow, so that a special effect of a fisheye lens becomes difficult to be obtained. FIGS. 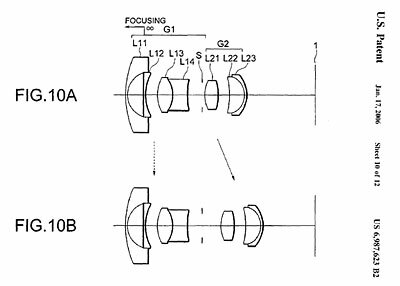 10A and 10B are sectional views showing a fisheye lens system according to Example 2 of the present invention in the maximum focal length state, and in the minimum focal length state, respectively. The present invention is made in view of the aforementioned problems and has an object to provide a fisheye lens system having an angle of view of 170 degrees or more capable of being used with a plurality of cameras having different image formats in size. In one preferred embodiment of the present invention, the lens system may be used for a plurality of cameras whose image sizes are different with each other. When the lens system is attached to a camera having the maximum image size in the maximum focal length state, the lens system has an angle of view of 170 degrees or more. When the lens system is attached to a camera having the minimum image size in the minimum focal length state, the lens system has an angle of view of 170 degrees or more. In one preferred embodiment of the present invention, the lens system may be used by changing over two states that are the maximum focal length state and the minimum focal length state. Upon changing over each state, the first lens group is not moved, and the second lens group is moved. Additional advantages and modification will readily occur to those skilled in the art. Therefore, the invention in its broader aspects is not limited to the specific details, and representative devices shown and described herein.